That dreaded, final day arrived. 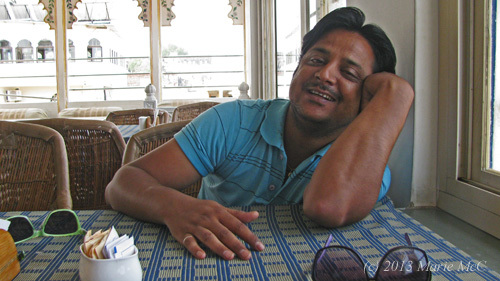 The guys met me at the Mewar Haveli for breakfast. We were all moping, knowing that our month of fun together would soon be at an end. Nirmal arrived looking tired. He hadn’t had much sleep and didn’t even have time to find clean clothes. He was wearing the same chocolate-smeared shirt as he had on at the party the night before. Rafiq’s brother Imtiyaz joined us. Pushker has a big bromance going with him. Pushker loves him like he was his own brother, and there’s nothing he wouldn’t do for him. But he’s constantly punching him, poking him and screwing around with him. That’s how guys show other guys love: with plenty of punishment! We talked and laughed, avoiding talking about the inevitable. In a few hours, they’d be driving me to the airport. What was I going to do without my daily dose of dudes and laughter?? I’ve been back in the States for a couple of months now. It’s where I live, but it doesn’t seem like home any more. Udaipur and having my dudes around me is what seems like home. They’ve become an important part of my life. I miss them terribly and think of them every day. We’re all anticipating now. 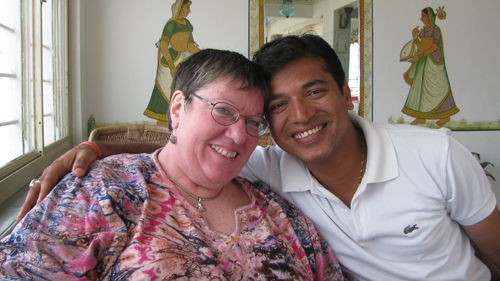 I’ll be back in Udaipur in February 2014. The day before I was to return to the States was a foodie sort of day. We had kichiri for lunch at the Island Tower. 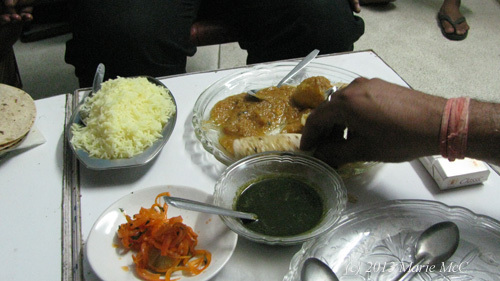 Kichiri is made with broken rice, which is less expensive. It has a good amount of haldi (turmeric), which you can see by the bright yellow color, a little cayenne and some bay leaves. There were also a little bit of diced vegetables, whatever was handy. 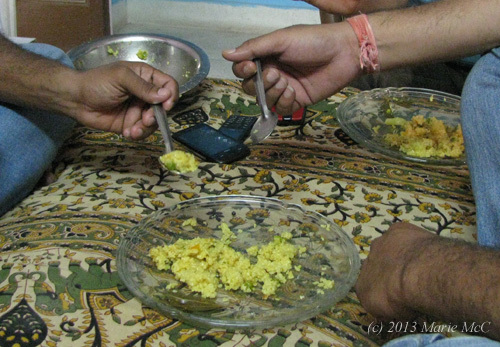 We had had kichiri for lunch many times. It was tasty and fast to make with the pressure cooker. cook, and Chotu, the errand runner. In the evening the guys threw a little party for me, which included a chocolate cake! What a lovely surprise! 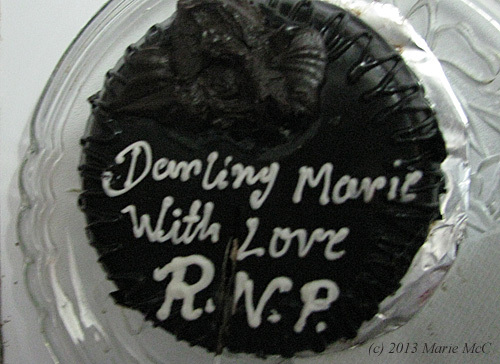 Love professed on a chocolate cake from Rafiq, Nirmal and Pushker. Having downed a cosmopolitan or two, I’m lucky I remembered to stop and snap a photo before I cut it! Aw, how cute! They’re feeding it to me! Pushker is really into this! Dinner is served! Daal, rice, chapatti, carrots and chutney. Last, but not least, tandoori chicken. 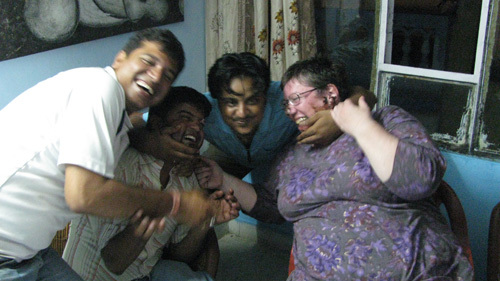 and Nirmal proceeded to smear my face with chocolate frosting! Funny, but a waste of good frosting, if you ask me. This photo is typical of how we are together: laughing, crazy and most of all, enjoying being together. We enjoyed ourselves immensely, but there was underneath it all a small twinge of sadness, knowing that the next day I would be leaving. A home in Naga Nagri. 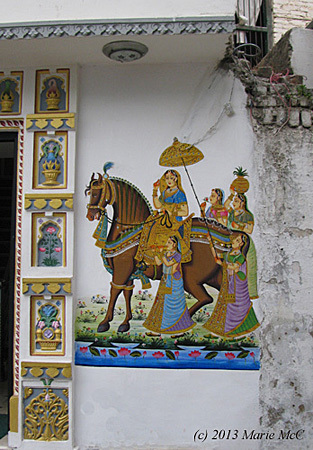 City of Murals should be Udaipur’s official nickname. It’s more fitting than Lake City or the Venice of Rajasthan. 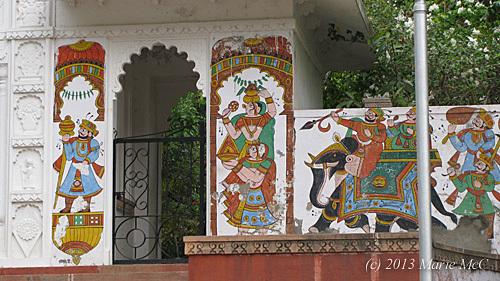 There are only five main lakes within Udaipur’s city limits, but there are hundreds — maybe thousands — of murals. 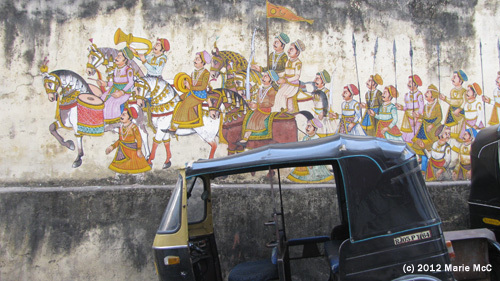 I haven’t seen such a proliferation of murals in any other Indian city. a new hotel in Naga Nagri. 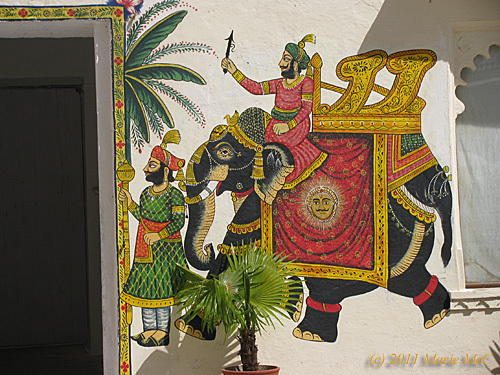 Murals aren’t just a quaint custom of the past in Udaipur. New ones are going up all the time on homes and commercial buildings. Murals aren’t found only in more prosperous areas. I’ve seen them all over the city, in modest neighborhoods as well as more opulent ones. A week later, the finished work of art. 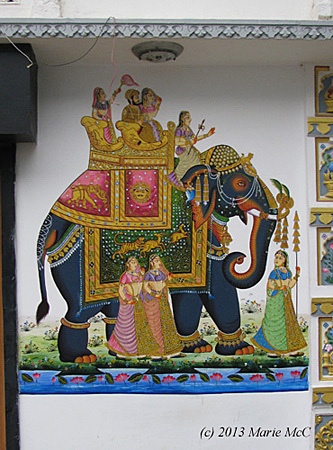 The one thing they have in common is that they are painted in the traditional style, depicting scenes from the Mughal age. the elephant is this beautiful scene. At Sunset Point: in need of a touchup. Once murals are painted, it doesn’t seem to be on anyone’s priority list to keep them maintained. They seem to show the wear and tear of weather and pollution rather quickly. On a wall in Lal Ghat. 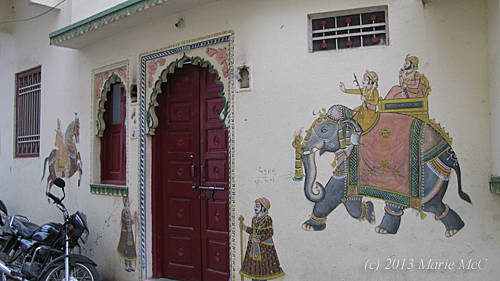 This one, next to the Mewar Haveli Hotel in the Lal Ghat area, looked newly painted in 2007. Only five years later, the effects of sun, rain and auto exhaust are evident. 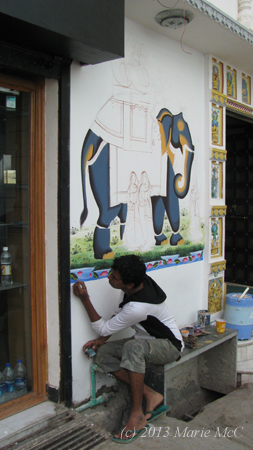 The murals at the City Palace were in excellent condition. Maybe they were recently done, or perhaps they’re better cared for because they are part of an important tourist attraction. 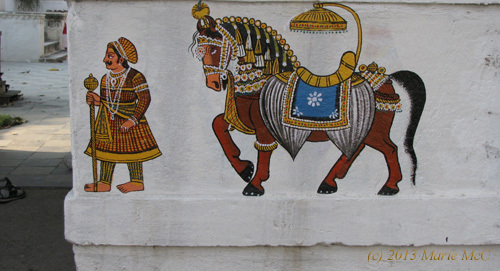 On a wall at Ahar Cenotaphs. I hope the custom of mural painting never goes out of style in this city. 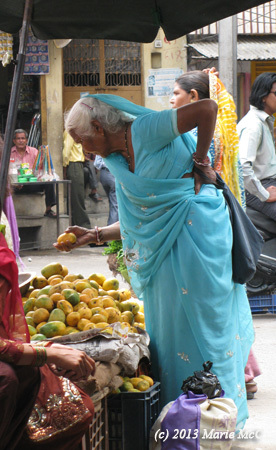 It’s one of the many things about Udaipur that I love. 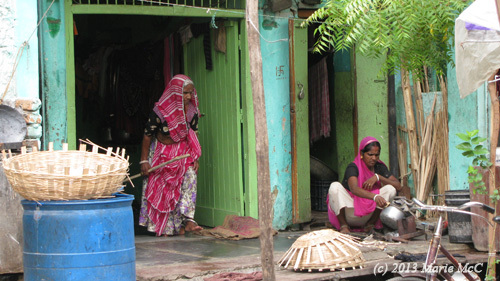 More sights from the bazaar area of old Udaipur. Behind the vegetable sellers was a row of houses. I liked the colors of the houses and the scarfs. The beautifully adorned foot of a vegetable walla. Toe rings are the sign of a married woman. 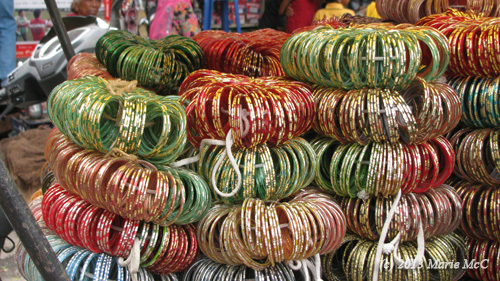 Bangles — the round, rigid style of bracelet — more than just a fashion accessory, although they are definitely that, they are the sign of a married Indian woman. It’s considered unlucky for a married woman to have bare arms. 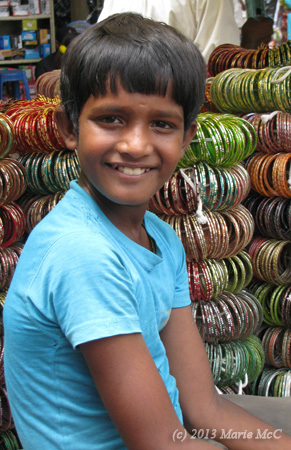 Bangles are sold everywhere, even in the most unlikely places. More is better. I’ve seen many a woman covered from elbow to wrist in them. Check out the bangles on the ladies at the wedding I attended last November. 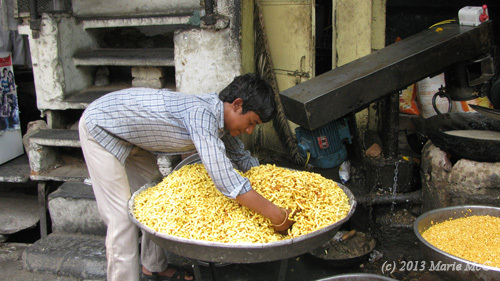 Making deep fried snacks from lentil flour.